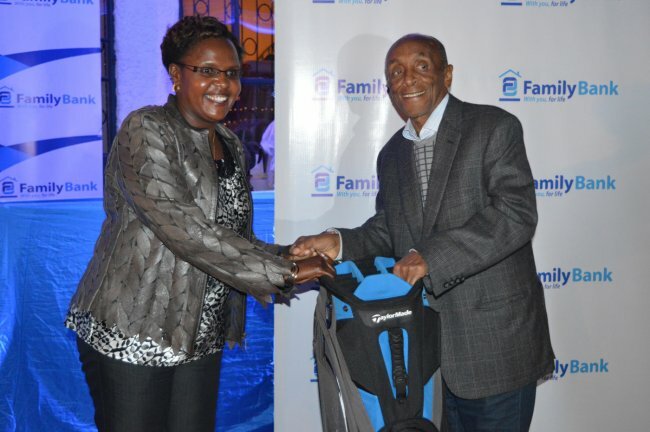 Jane Koech won the annual Family Bank Golf tournament in Eldoret. Home golfer Jane Koech carded 39 stable points to win the annual Family Bank Golf tournament at the par 71, Eldoret golf course on Saturday. Playing handicap 15, Koech registered top results when she recorded 17 points on the Outward nine and a further 22 points on the Inward nine for a solid score of 39 stable ford to emerge the Overall winner. She sunk eight pars, a birdie, eight bogeys and a blank in hole 13 to clinch the prestigious trophy. The golfer who practices three times a week was familiar with the course and played in the morning, the same time she always trains. “I always train three times a week every morning and that has yielded some fruits. I played in the first flight at 7 a.m. which was an advantage against the rest,” said Koech. Koech acknowledged she had a good playing team and winning came to her as a big surprise. Emerging as the overall winner was something she never imagined and promise to defend the title next year. Lady Captain Esther Chumo took the second position with a total of 39 points losing to Koech on count back before first man Brian Chemjor completed the podium on 38 stable ford points beating Parit Sanghrajka on count backs. Club’s vice captain Sandeep Grewal came a distant fifth with 37 stable ford points before Ankit Patel completed the top six prize list finishers with 36 stable ford points. Hard hitter Sanghrajka and lady Captain Chumo stepped on the platform again to receive the Men’s and ladies Longest Drive winners respectively. The Nines winners were Neel Shah as James Chirchir won the first nine on a score of 20 stable ford points with Chris Birgen taking the 2nd Nines prize with the similar score.